Horse shows can be as simple as friends playing gymkhana games for computer printout awards or as elaborate as multi-day events with hundreds of competitors and expensive prizes. The size of your horse show will depend on your resources and projected attendance. Here are suggestions to help you as you plan your own horse show or gymkhana. Three things should be organized early on. You will need a venue, a team of volunteers to whom you can delegate various tasks, and proper insurance. Contact your own insurance company, or one that specializes in horse events. You may want to require that all competitors have their own insurance. Some events require testing for EIA or other infectious diseases too. 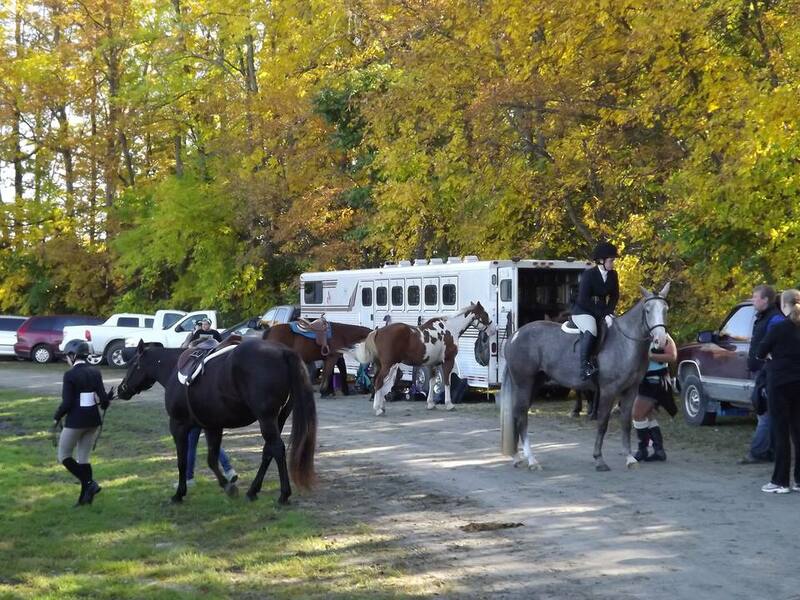 If you have an arena or riding ring and space for trucks and trailers, you may have an appropriate venue in your backyard. If not, you’ll need a location with good footing for people, horses and rigs, a water source and a safe riding area. You might need electrical hook-up if you’re using things like coffee pots and PA systems. If there is no proper ring set up already, you will need to set up safe temporary fencing around the ring area. I’ve seen wooden snow fencing, and metal T-posts strung with rope used, which I do not consider safe. Plastic tape tends to flutter in the breeze and make strange whirring noises that spook horses. Below, I’ve asked readers to offer suggestions for running safe and efficient horse shows, so perhaps someone has found the ultimate safe, attractive, inexpensive portable fence. Before the day of the show, you’ll have to decide on a class list. You may want to advertise your show. This can be in the form of invitations, flyers, newspaper or magazine ads, webpages or radio and TV announcements. Your judge and steward will need to be fed and watered, kept out of the weather as much possible and provided with clipboard, paper and pen. Of course you’ll want to take good care of all the volunteers, especially the ‘volun-tolds’, like husbands who would rather be golfing or fishing, but are donating their time in support of their horse crazy spouses and kids. Draws, special prizes and recognition, free hot dogs and cold (or hot) drinks will make this a good experience—very important if you want them back. Depending on where you are in the world, a blue ribbon could mean first or second place. This chart shows you the colors of rosettes or ribbons generally used in United States, Canada, Britain and Australia. The colors may change according to the event organizer's preferences, the club colors, or budget. Awarding ribbons of all one color may be more economical for a small organization. In some countries or areas, traditional colors may not be used at all. In Holland, orange often signifies first place. Often the colors used for the first five placings are traditional, but ribbon colors from 6th downwards are less consistent. Be sure to order your awards well ahead of your show date. Try to have all of your equipment set up a day before the show if possible. Arrive early at the show grounds and get your entries secretary set up. Show your judge where the food, outhouse and sun/rain shelter are. Ask what they like in their coffee. Depending on the size of your show, you might consider having a first aid team onsight. A service like St. John’s Ambulance usually requires an honorarium. At minimum, you should have one or two people trained in first aid on the grounds. When the trailers start rolling in you may want your ground crew to organize the parking. The entries desk should be open early, with entry packages ready if the entries sent in or forms, rider numbers and change for post-entries. A member of the ground crew can usher horses in and out of the ring, while the judge and steward control what is happening inside the ring. A go-fer can transfer information between show secretary, judge and announcer. Your ground crew can set up and reset jumps, game props and trail obstacles. When your show is over, the work isn’t done. It’s time to clean up, return borrowed equipment, tally scores if you’re planning a series with awards at the end and pay any remaining bills. Send thank you letters, and perhaps a photograph of someone receiving their prize, to any sponsors. Look over your initial plan and consider how things went so you can revise it if you decide to hold a show again.